There is no better way to tap into today’s soup craze than with this glorious cookbook, filled with more than 100 delicious low-fat soup recipes. 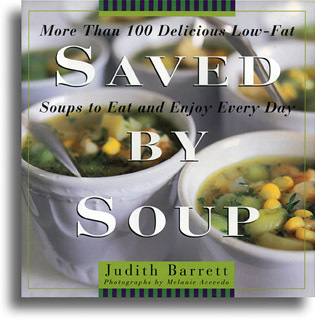 Author Judith Barrett lost pounds and inches using these mouthwatering recipes, each of which contains less than three grams of fat per serving. And cutting the fat posed no bar to creating soups with incredible flavor—Black Mushroom and Spinach Wonton Soup and Creamy Fennel Soup with Shrimp both contain only one gram of fat. Barrett offers soups to be savored in every season. In the fall, Creamy Carrot Soup or Roasted Beet Borscht will delight you. Winter Squash Soup with Thyme or Real Gumbo with Okra and Chicken is sure to take the edge off the cold during the snowy months. Come springtime, there is Vidalia Onion Soup or Arugula Vichyssoise, and, to beat the summertime heat, make a batch of Cool Cucumber and Yogurt Soup or Creamy Tomato Bisque with Shallots and Tarragon. You have a veritable calendar full of soup pleasures at your fingertips. Soups “from the sea,” like Mediterranean Fish Soup and New York Red Clam Chowder, will leave a briny tingle on your palate. If it’s legumes you crave, try one of the unbeatable bean soups: Lentil and Portobello Mushroom Soup, Miami Black Bean Soup, Lemony Chickpea and Escarole Soup. Or experiment with the variety of international soup recipes that are offered, from Japanese Dashi with Soba and Scallions to Chinese Cabbage Soup with Cellophane Noodles to Italian Minestra of Swiss Chard and Rice. No matter what you like to eat, soup is always the answer. The heartiest of eaters will be satisfied with a steaming bowl of Ligurian Minestrone or thick Garlicky White Bean and Spinach Soup. For those times you’d like something a little lighter, try Mushroom Consommé with Vegetable Confetti or Zucchini and Basil Soup. Feeling run-down? There is nothing better for what ails you than a nourishing bowl of Chinese Chicken Noodle Soup with Spinach and Ginger or Miso and Vegetable Soup. And to appease those with their eyes always on dessert, there are Tangy Strawberry Rhubarb Soup and Pear and Red Wine Soup. So grab a spoon and join in today’s soup revolution!